One of Harper's friends had a birthday party on Saturday. 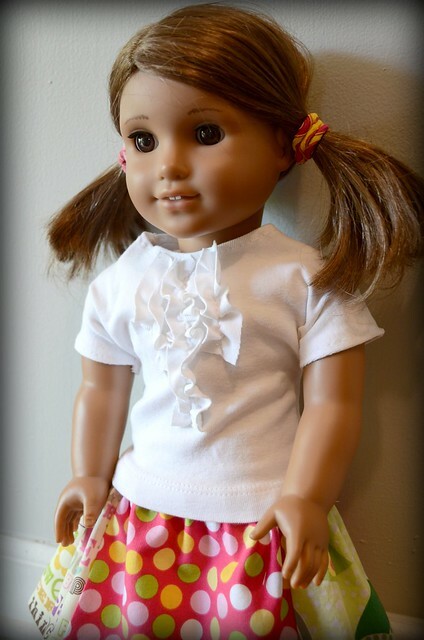 When Harper asked her what she wanted for her birthday, she said doll clothes for her new American Girl doll. That is all the motivation I needed to get sewing. I love making these little outfits. I created the pattern for the t-shirt. I wanted a simple tee that was only a couple of pieces. I used one of my old t-shirts so I didn't have to hem the bottom. I should have a tutorial up for it tomorrow. The skirt is made from five 7 inch squares. I sewed them together then hemmed the bottom. The waist is elastic. 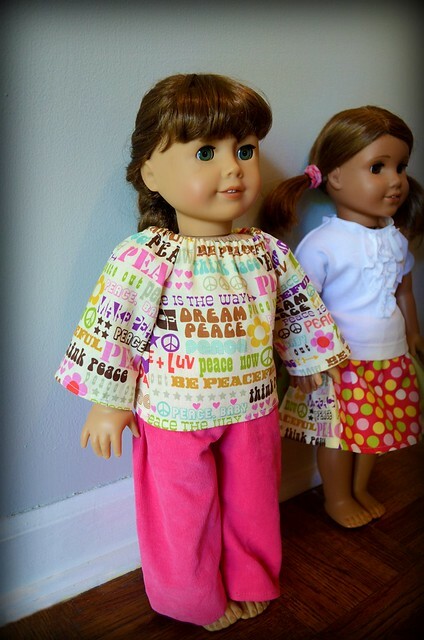 The peasant shirt and pants are from patterns that I already had. I wanted all the pieces to be interchangeable so she can have 4 different outfit combinations. See you tomorrow with the t-shirt pattern and tutorial. Awesome! I remember my grandmother making doll clothes for my sister and I as kids. We actually still have the clothes, not the dolls though. These are so cute. I really like the ruffles on the tee. 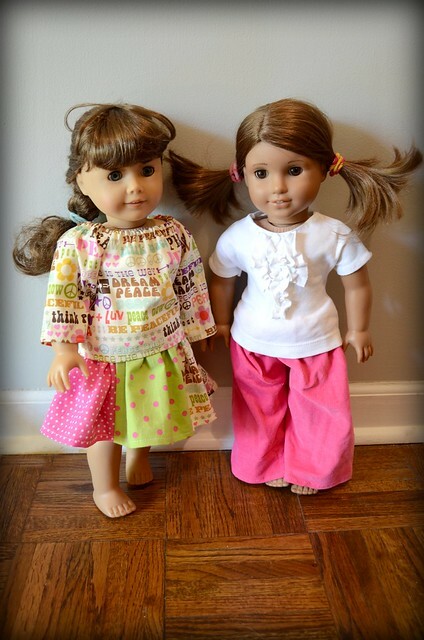 Have you checked out Libery Jane's free doll clothes patterns? Way adorable!! Great color choices too!! I just adore these clothes - thanks for the inspiration. As I am a beginner on the sewing front can I ask how much elastic you need for the waist band of the skirt 7 inches x 5 pieces - elastic for waist??? I have just made this skirt with an 11 inch piece and wonder is it too big? Don't have a doll to check on as they are going to be gifts for my nieces. Thanks so much. Very cute outfits!! I love them all! 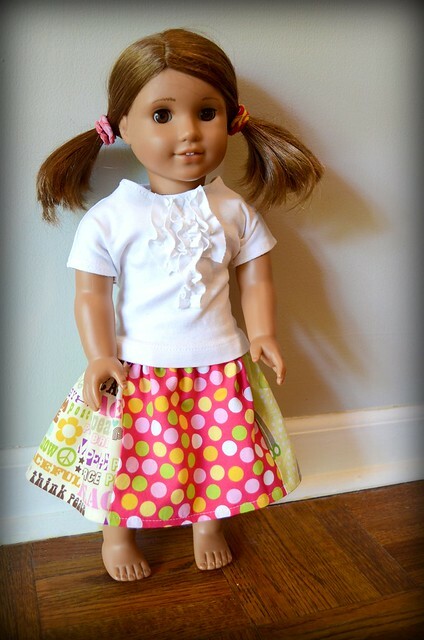 I would love it if you checked out my own AG blog http://taraheartag.blogspot.com/ Here you will find tips and lots of photos of AG dolls!